▪ Fire Service Day, Saturday, May 11, All Day, Various Locations - See ACS Calendar for Details! "Amateur means unpaid, not unprofessional!" The Emergency Management Department of the City of Los Angeles has designated the Los Angeles Fire Department to manage its amateur radio program under the Auxiliary Communications Service agreement with the State Office of Emergency Services. Because Auxiliary Communications Service Members are authorized by the California Governor's Office of Emergency Service, ACS Members are sworn Disaster Service Workers. The LAFD Auxiliary Communications Service (ACS) is the Official Amateur Radio Emergency Communications Group for the City of Los Angeles and is the RACES organization for the City of Los Angeles. 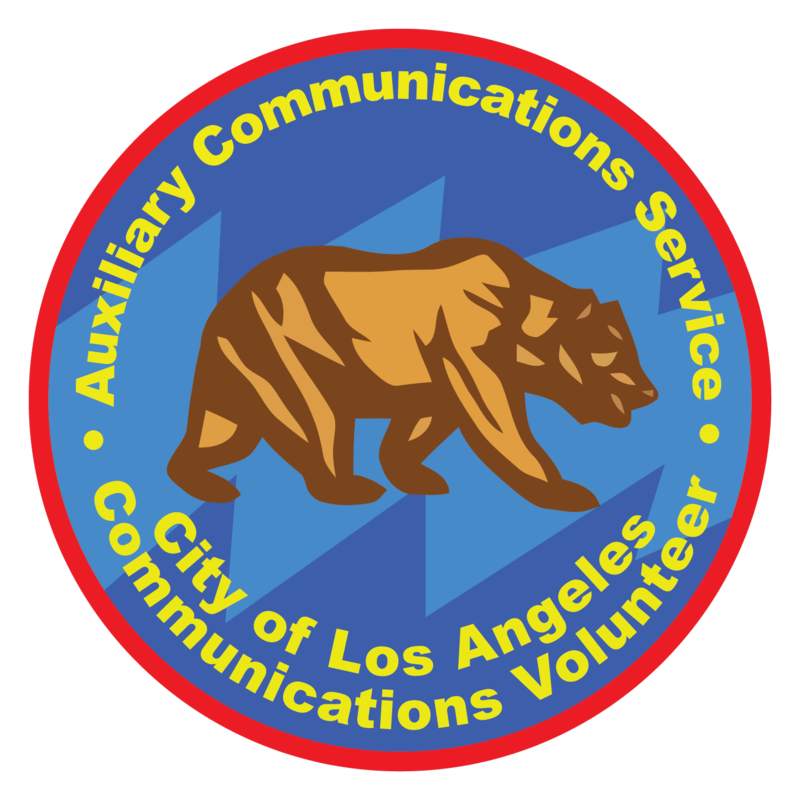 The LAFD administration has authorized the Auxiliary Communications Service (ACS) to enroll as many as 500 licensed HAMS to back up the Department's 800 MHz radio system and to provide other Emergency Communications services to the City. ACS members are used to facilitate auxiliary communications during earthquakes, brush fires, power outages, and other disasters. ACS members are subject to a background check and must meet the qualifications as a Los Angeles City Volunteer under the Mayor’s Office Volunteer Bureau’s requirements. They also must meet the California Governor’s Office of Emergency Services (OES) Disaster Service Worker requirements. If you would like more information on the ACS and its mentoring and training programs, please see "Become an ACS Volunteer" below. The primary mission of the LAFD ACS is to provide back-up for the LAFD's 800-mhz radio system. Because LAFD's radio system is highly reliant on repeaters to reach all areas of the City, it is also vulnerable should the repeaters become inoperative due to physical damage in an earthquake or loss of power for a prolonged time period. In such an event, LAFD ACS volunteer amateur radio operators, using a combination of their own equipment and fixed City Facilities, would step-in to relay vital communications from the City Emergency Operations Center (EOC) and the LAFD Department Operations Center (DOC) to Fire Department resources in the field. Because amateur radio is incredibly versatile, we can do this without relying on repeaters or other infrastructure. In addition to providing communications between the EOC / DOC and LAFD field resources, ACS members will be deployed to Community Emergency Response Team (CERT) Incident Command Posts and other public locations to act as a communications link between the public and LAFD Command. ACS members deployed throughout the City will also provide situational size-up and other critical emergency information to the Emergency Operations Center, providing City Department Managers with the information they need to make informed decisions. LAFD ACS members would also use amateur radio to provide communications between the LAFD and outside agencies, including the County of Los Angeles and the Governor's Office of Emergency Services (OES). The LAFD ACS also provides communications support for many community events such as the Hollywood Christmas Parade and the March of Dimes March for Babies. This not only provides a service to these events, but allows members to test our equipment and to practice the communication skills needed in an emergency. In addition to volunteering as an LAFD ACS radio operator, you can help by donating. LAFD ACS has no budget. Most of our equipment is provided by our members. We are working, however, to establish a series of fixed stations at key locations throughout the City. Los Angeles is a very complex radio environment with mountains, canyons, and tall buildings. These stations will allow us to respond more quickly in an emergency and to have a reliable radio link between Fire Department Management and resources in the field. The equipment to set-up these stations and for the maintenance therof has been supplied in the past with surplus commercial equipment obtained through the City. Although we've managed to force this equipment to work, it is not intended for our uses and only partially meets our requirements. Donatations made to LAFD ACS via the LAFD Foundation will allow us to keep these stations going, make them work better, and allow us to add stations to better serve the City. If you'd like to make a tax deductable donation to the LAFD ACS, please contact Michael Schlenker. "The mission of the Los Angeles Fire Department Auxiliary Communications Service is to provide the City and the Citizens of Los Angeles with professional communications services using volunteers and volunteer provided equipment under the direction and authority of the City Radio Officer and the Los Angeles Fire Department." LAFD ACS is always looking for amateur radio operators who either live or work in the City of Los Angeles. If you'd like to know more about what ACS does, feel free to download and review our Interim Book 73 from the "Download" page of this web site. If you are a licensed amateur radio operator, live or work within the City of Los Angeles and are at least 18-years old and have an interest in emergency communications and serving your community, please join ACS. If you'd like to apply for membership in the LAFD ACS, please click the link below to download the application documents. Click Here to download our Application Packet.